Up to age 11, most children walk to school. Some take their bikes, either because they live a little further away, or just for fun. There’s no problem with small children cycling on the pavement (up to age 10). Quiet routes pass close to each school, so older children can start using the road, under adult supervision. 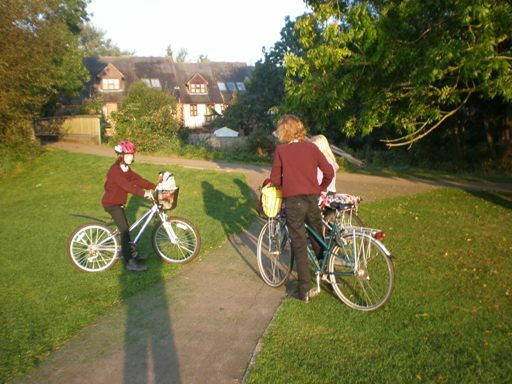 Secondary school means getting up a bit earlier, and meeting your friends so you can cycle together on the quiet route. This was one of three separate groups meeting up in the park. Secondary schools are generally in the suburbs, and served by quiet routes that are mostly separate from the main road routes that adults use to get to the city centre.